[ Thomas Hardy, RN ] Autograph Note, third person, to Joseph Glynn, Civil Engineer, thanking him for a Print by the latter..
Rear Admiral Sir Thomas Hardy [ Thomas Masterman Hardy, sometime Captain of the "Victory" under Nelson ], Governor, Greenwich Hospital. Greenwich Hospital, 27 November 1834. One page, 12mo, fold marks, signs on being tipped into an album, good conition. "Rear Admiral Sir Thomas Hardy presents his Compliments to Mr. Glynn and begs to return his best thanks for a Print of a Bridge over the River Aire." On letterhead of the Royal Greenwich Observatory. 1 July 1919. [ Nicholas Tindal, Chaplain to Greenwich Hospital, historian. ] Autograph Signature ('N: Tindal') to Exchequer receipt. [ His Majesty's Receipt of Exchequer, London. ] 27 July 1761. 1p., 8vo. In fair condition, aged and worn. Laid out in the usual way, with printed text completed in manuscript. Records a payment of ten pounds on an annuity, 'during the Life of Anna Maria Tindal'. With signature of witness 'Alexr. Ross'. [ Ernest Augustus, Duke of Cumberland (later King of Hanover) and the Royal Naval Asylum, Greenwich. ] 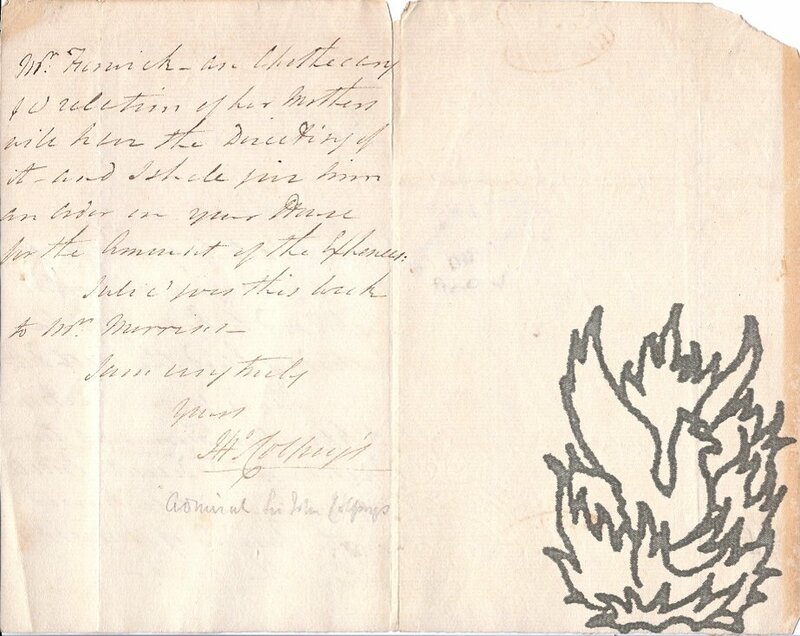 Autograph Letter Signed ('Ernest Augustus') to Rev. William Morgan, giving instructions regarding the appointment of matrons to the institution. St James's Palace [ London ]. 1 January 1808. The Duke was the head of the Committee in charge of the Royal Naval Asylum, which had been founded as the British National Endeavour in 1798, for the orphans of military and naval personnel killed in action. It had moved from Paddington to the Queen's House, Greenwich, in October 1807, having received a large amount of public support (including that of Lord Nelson), and was responsible for upwards of 1000 boys and girls. 3pp., 4to. Bifolium. 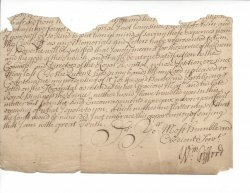 On aged paper, with damp damage resulting in some loss (including a little text). Repaired with archival tape. Manuscript headed 'A Valuation of Houses and Gardens &c in Corbridge as follows', giving names of proprietors, tenants, 'What the Building consists of' and valuations. 10pp., 4to. On five leaves pinned together. In good condition, on aged laid paper with Britannia watermark. Folded into the customary packet, and docketted 'Valuation of Corbrid. Houses & Gardens &c.' Arranged in ten columns: No. of Claim; Proprietors Names; Situation & Tennants Names; What the Building consists [Premises consist] of; Particular Content of Land [Gardens &c]; Total Content of Land; Particular rent of Houses & Land; Yearly rent of Houses & Land; Houses & Land proportioned; Total Claim. 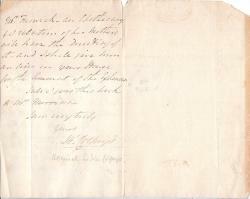 Autograph Letter Signed ('Brassey') from Brassey to 'P. Michelli [later Sir Pietro James Michelli], Esq | Secretary | Seaman's Hospital', regretting that he was not able to visit the Albert Docks. On letterhead of 24 Park Lane, W. [London]. 16 July 1889. 1p., 12mo. Fair, on lightly-aged paper, with short closed tear to one edge and traces of mount on blank second leaf of bifolium. Signature slightly smudged. Brassey writes that he has been 'detained at the House of Lords, where I have been acting as chairman of a private committee', and as a result 'found it impossible to go down to the Albert Docks yesterday afternoon'. 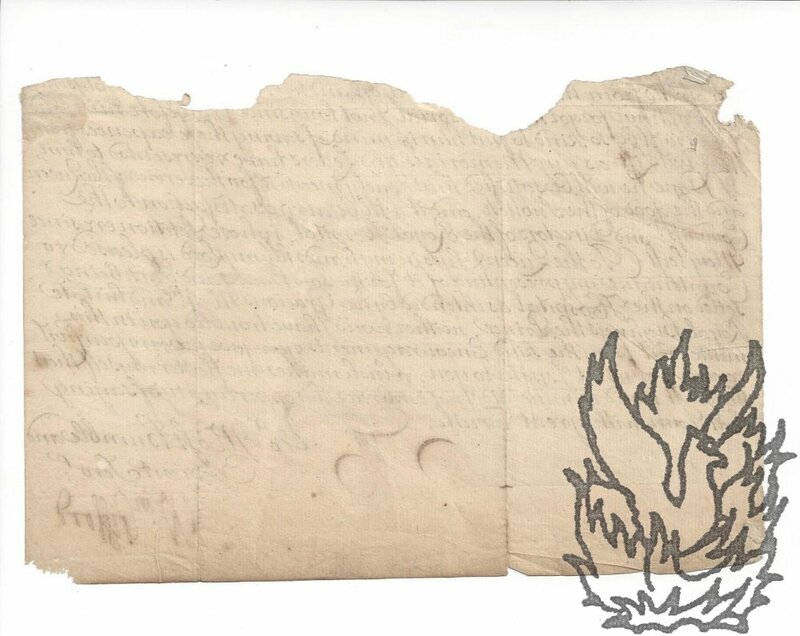 The letter almost certainly relates to the Albert Dock Seaman's Hospital, which was officially opened the following year, as a branch of the Dreadnought Seamen's Hospital, Greenwich. Autograph Letter Signed ('Jno Colpoys') from Admiral Sir John Colpoys, Governor of Greenwich Hospital, to James Sykes Jnr, regarding arrangements following the death of 'Poor Georgina'. 12mo, 2 pp. Bifolium, with the reverse of the second leaf carrying the address ('J. Sykes Esqr: | 22 Arundel Street | Strand', with two postmarks and docketing by Sykes. Nineteen lines. Text clear and complete. On aged paper, with wear to second leaf. Sykes 'will not be surprized to hear' that on the previous day 'Poor Georgina [...] paid the Great Debt'. Colpoys has arranged for her funeral to be 'conducted - in a Decent Private manner', and for her to be buried 'in the Parish of Kensington where she Died - Mr.
Manuscript letter book containing transcriptions of thirty-three orders, many of them from the Admiralty, received by Paterson relating to his command of HMS Gorgon between 1792 and 1793. First letter dated 'Admiralty Office 22 Decembr 92 [22 December 1792]'; last letter dated 'Sandwich at the Nore 2nd Augt 93 [2 August 1793]'. Stitched notebook, in original marbled wraps, containing 19 manuscript pages on ten leaves. Leaf dimensions 32.5 x 20.5 cm. On laid paper with Britannia watermark. Good, on aged paper, in worn and creased wraps. Text closely and neatly written, clear and complete. From the Tonyn and Paterson family papers, but not in Paterson's hand. Contains transcriptions, in Paterson's hand, of thirty-three orders, twenty-four of which are addressed to him personally, the other nine being general orders 'To the respective Captains Commanders & Commanding Officers of H.M. Ships & Vessels'. Printed form headed 'Royal Naval College,' not filled in, which when completed is intended to give 'an account' of the 'progress' made by an individual 'in his studies at this establishment'. Without date or place [early nineteenth century]. Folio bifolium (dimensions of leaf roughly 32 x 20 cm): one page, with the reverse of the leaf and the whole of the second leaf of the bifolium blank. Unbound. Good, on lightly aged and creased laid paper with a Britannia watermark. Eighteen lines of text, mostly taken up with comments on the teaching at the College of Latin and Greek, followed by an 'Extract from the General Report transmitted to the Admiralty Office' with room for the Student's name, his date of admission, and progress in mathematics, English, Latin and Greek, History and Geography, French and Drawing. 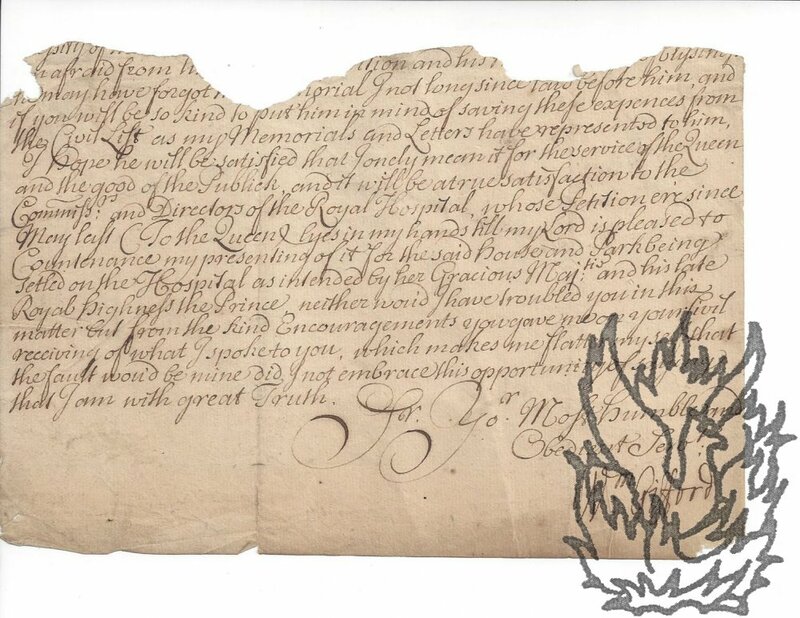 Printed letter, with autograph additions and signature, from Hall to Paterson, concerning his 'plan for the quick application of mats for stopping leaks in Iron Vessels'. 2 March 1876; Admiralty [London]. Foolscap bifolium (leaf dimensions 33 x 20.5 cm). Good, on aged and lightly creased paper. The letter, the printed text of which invites the recipient to 'forward to this Office a clear description' of his invention, is on the recto of the first leaf. Particularising details and signature by Hall, who has addressed it to 'Commander Paterson R.N. | Brockhurst House | Brockhurst | Gosport | Hants'. Docketed and initialed by Paterson at head. The recto of the second leaf contains a printed 'Memorandum' by W. G.
12mo: 1 p. On first leaf of a bifolium. Very good. Clearly responding to a request for an autograph. Reads 'faithfully yours | [signed] James Glaisher'. Two Typed Notes Signed to [C.H. Grinling, socialist, editor of the Woolwich "Pioneer"
Member of Parliament, economist, etc. Two pages each, 8vo, good condition, one docketed with writer's name, etc. in another hand [Grinling's?]. [14-11-05] He tells Grinling that his "Riches and Poverty" is the right response to the latter's "first paragraph", and the point is dealt with at length in two chapters. His column will also deal with the point. He goes on to emphasise the importance of a matter concerning electiricity. In an autograph postscript, Money says "The 'Pioneer' has gone astray - I get more papers than I can look at. Typed Letter Signed to Sir Henry Trueman Wood, School for the Art of Theatre, 7, John Street, Adelphi, London. English engineer and naval architect (1842-1932). One page, 4to. Good, but lightly creased and slightly discoloured at foot. Bears the stamp of the Royal Society of Arts, of which Wood was the Secretary. Thanks Wood for his 'kind telegram of congratulation' (presumably on his knighthood).